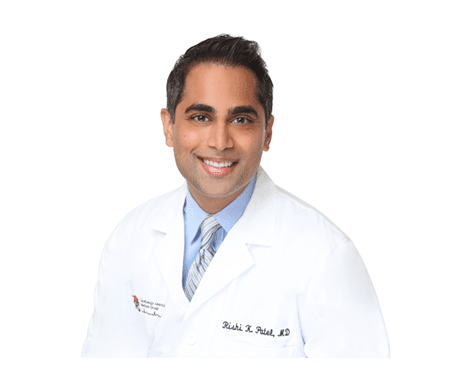 Rishi Patel, MD, FACC, is a board-certified cardiologist at Phoenix Heart, with locations in Glendale, Goodyear, Anthem, Buckeye, and Black Canyon City, Arizona. Dr. Patel focuses on general and interventional cardiology, cardiovascular consultations and interventions, and valvuloplasty. Dr. Patel has been published in a number of esteemed medical journals and given presentations on the most advanced techniques in use today to his peers in the United States and the United Kingdom. Dr. Patel received his medical degree from the Colleges of Medicine, Pharmacy, and Graduate Studies at Northeast Ohio University in Rootstown, Ohio. After graduation, Dr. Patel moved to nearby Cleveland, Ohio, where he completed his internship and residency at the Case Western Reserve University Hospitals of Cleveland. Once his training at this world-renowned hospital was done, Dr. Patel completed two fellowships, one in cardiovascular medicine at Henry Ford Hospital in Detroit, and one where he served as chief fellow in interventional cardiology at Banner Good Samaritan Medical Center in Phoenix. Dr. Patel is certified in cardiovascular medicine and nuclear cardiology by the American Board of Internal Medicine. He’s not only a fellow of the American College of Cardiology, but he’s also a member of the American Medical Association, the American Heart Association, and the American Society of Nuclear Cardiology. We accept the following insurance plans. Please call our office if you have any questions, or to verify your insurance coverage.